Technology meets timeless. 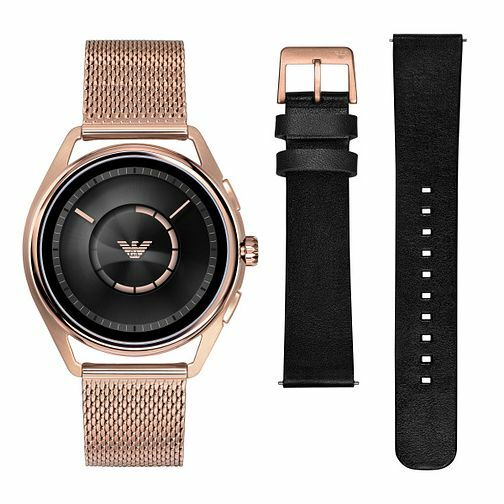 This Connected smartwatch by Emporio Armani boasts an interactive touch-screen. Compatible with your smartphone this wristwear can connect to your favourite apps, music library, text notifications and more. The future is now, with a rose gold plated case, this classic piece presents a smart and sleek design. This watch is water resistant up to 50 metres, and with interchangable straps, this set comes with both a black rubber strap and rose gold plated mesh bracelet, ideal for both casual and dress wear. Team sophistication with high fashion and the result is Emporio Armani's beautiful collection.